A handful of communities along this part of the Hudson River -- the cities of Albany, Cohoes, Rensselaer, Troy, and Watervliet, and the village of Green Island -- have very old sewer systems that are set up in a way that, when it rains a lot, they release a combined flow of water from both storm sewers and sanitary sewers into the Hudson. These events are called "combined sewer overflows" (CSOs). And, yep, it means that literal poop sometimes ends flowing into the river. It's a problem. 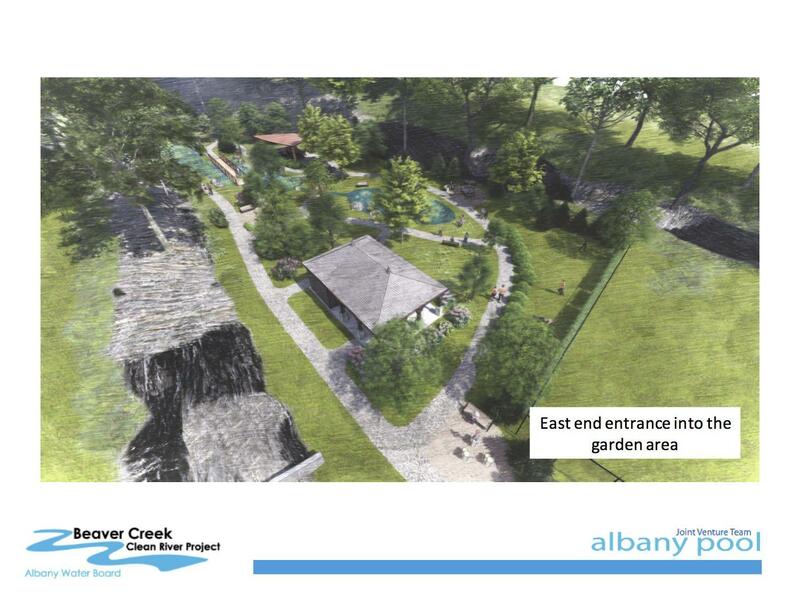 So much so that these communities -- "the Albany pool" -- are currently pursuing a $136 million plan over many years under a consent order with New York State to address the issue. This plan includes many different projects aimed at both reducing the amount of stormwater that ends up in these municipalities' "combined" sewer systems and also dealing with the water after it's in the systems. 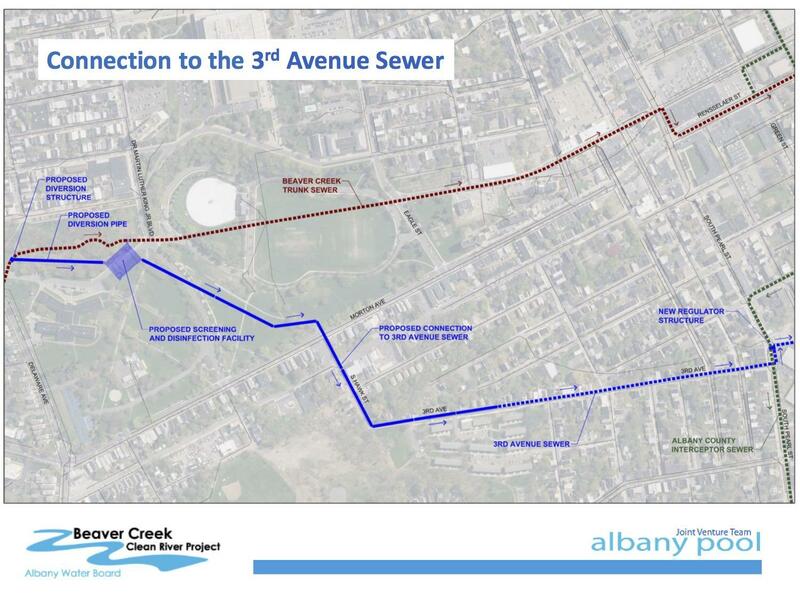 And the centerpiece of the entire project is dealing with the Beaver Creek sewer that drains 5.2 square miles of the geographic heart of the city Albany and ends up discharging roughly 530 million gallons of combined sewer water into the Hudson each year. 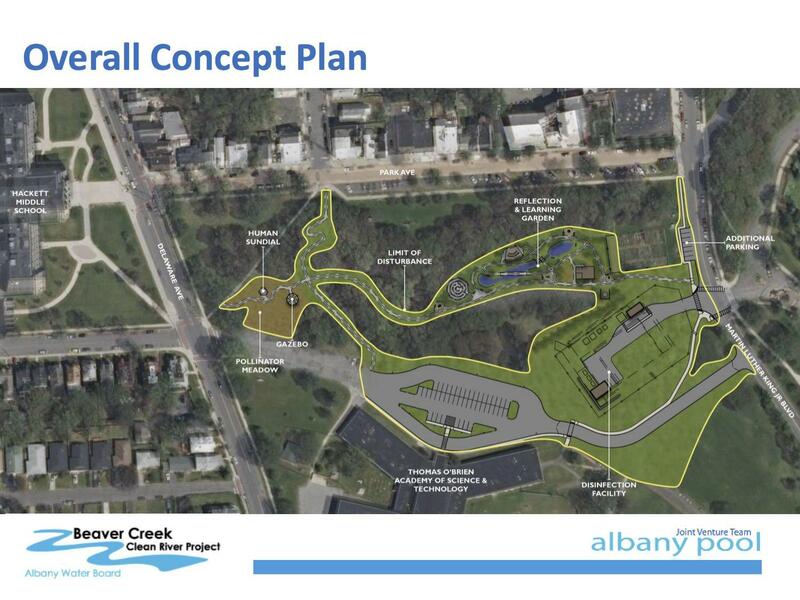 So that's why the Albany Water Board -- which owns the city's water and sewer systems -- is planning to spend $45 million on this specific project. (AWB is on the hook for $60 million of the overall plan.) It will not solve the entire problem, but it is a very significant step toward addressing it. The goal of the Beaver Creek Clean River Project is to screen out debris -- rags, trash, leaves, anything like that -- and disinfect the sewer water before it ultimately makes its way out into the Hudson River. And the plan has been to do that with a partially underground facility in the old Beaver Creek ravine in Lincoln Park that's adjacent to the Thomas O'Brien Academy of Science and Technology (TOAST). The location of the facility prompted a groundswell of community skepticism this past spring. And at a public meeting in April, people questioned the use of park land and the justice of siting the facility in this neighborhood, next to a school. The presentation from Tuesday's meeting is embedded at the top here -- click or scroll all the way up. The original plan for the project in Lincoln Park involved a facility that would screen out the debris, capture it, compact it, and then trucks would come take it away to a landfill. But Tuesday evening Albany, the Albany water department and the project team from the engineering firm CHA presented a significant modification: The design now includes a new sewer line that would run over to an existing line along Third Ave and then ultimately to the sewage treatment plant run by the county near the Port of Albany. And this line would be used for conveying the sorted debris to the county sewage treatment plant, which already handles that sort of material. Officials said the result would be less truck traffic at the site (because the debris would no longer have to be trucked away), a reduction in potential odor issues (because the material's not leaving the sewer), and a much smaller building (600 square feet compared to 5,000 square feet) and parking lot. "This is a significant change in concept that has evolved out of the community's concerns," CHA's Mike Miller told the crowd. He said the Third Ave line has the capacity to handle the new flows from the Lincoln Park facility, but the line will be cleaned and a crew will be running a camera through it to assess whether it needs any attention. It's worth noting that Albany County exec Dan McCoy appeared at the meeting to speak in support of the project. And mayor Kathy Sheehan praised McCoy and the county for being willing to cooperate. 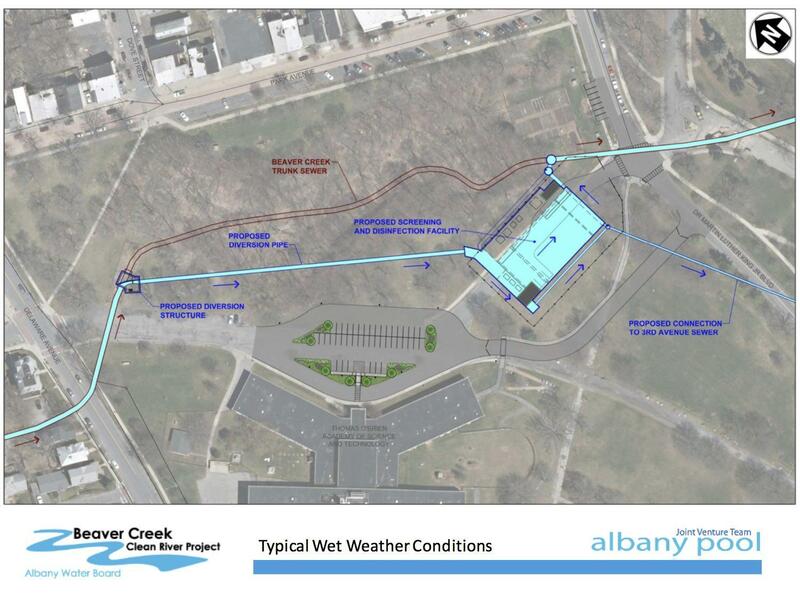 Joe Coffey -- Albany's commissioner of water and water supply -- told the crowd the state's consent order requires the water department to move ahead with final design of the Beaver Creek Clean River Project this December. Construction would start next year, with completion scheduled for 2022. + There are now two covered outdoor classroom spaces planned, one of them with bathrooms. + The meditation labyrinth has been moved and redesigned to be more accessible for people of various mobility levels. + There's a walking loop with a series of play pieces. + And, maybe most significant among the changes, there's now a planned path that would connect with Park Ave near Dove Street. That last change is notable because it takes on one of the goals -- better neighborhood connections -- that's come up in the discussion about the Lincoln Park master plan the city's planning department has been working on with consultants. At Tuesday's meeting, city officials said they've been coordinating with the planning department and aspects of this project can be folded into the master plan work. They'll also still be looking for public input on the park space elements. Joe Coffey -- the Albany water commissioner -- praised the new, modified plan for the Lincoln Park facility as a "really innovative design" and praised the work of deputy commissioner Bill Simcoe, as well as the teams from CHA and the Albany County Water Purification District. After the meeting, we asked Coffey if the new design would have come about if people in the community hadn't voiced their concerns about the potential impacts of this project. "We're always looking for ways to minimize operations and maintenance costs. And we weren't sure this other option was technically feasible ... so we had some time to think about it," Coffey said. "Certainly the community engagement part challenged us to be more open to other concepts and ideas. The facility still had to be at Lincoln Park to get the initial screening and disinfection. But how we handled the solids, was there a different way? So I think we were inspired by the community." 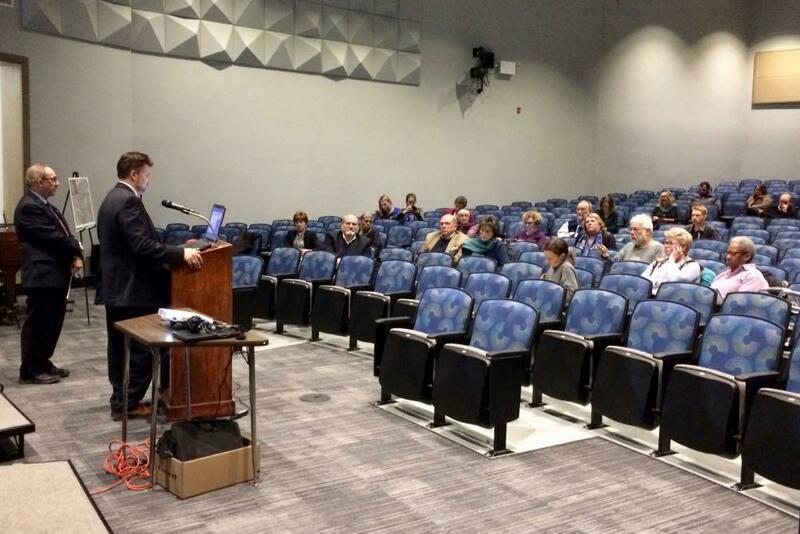 After that public meeting this past April -- in which many community members expressed skepticism, frustration, even anger with the project being sited in the park -- the water department held a series of meetings with community groups and convened a community advisory committee to provide input. One of the people on that committee is Simone Freeman, who lives nearby in the Delaware Ave neighborhood. At the April meeting she had commented that the plan was "laced with socioeconomic injustice" and had spoken against the project in other forums. She was back at Tuesday's meeting. And afterward we asked her what she thought about how things have turned out. "The water department, the mayor's office, they've been accessible. And I commend them in terms of basically saying, OK, what are your concerns," she said while talking about her experience on the committee. "We had a a very well thought out, engaging dialog process. It was very transparent with members saying, look, I don't like that." 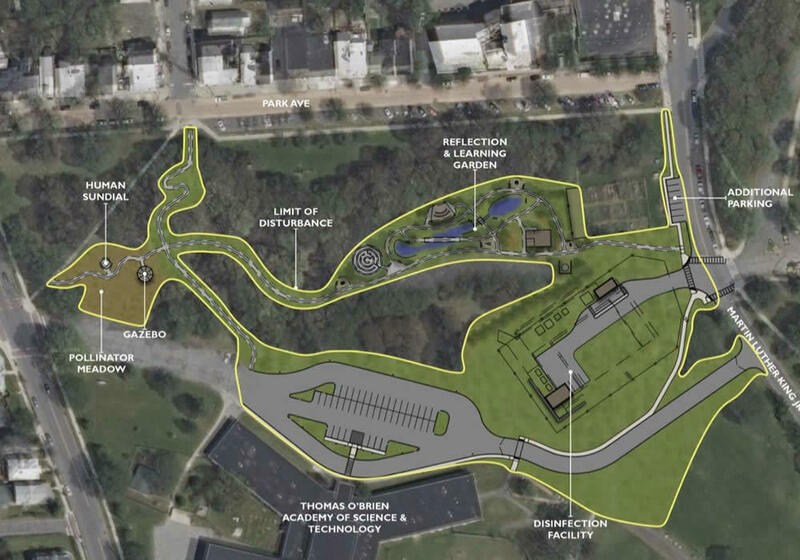 Freeman said she was very happy to learn about the modified design, the reduction in the size of the facility, and some of the elements for the park portion. "Am I, at the end of the day, happy that this project has to be built here? No. But it's a bit of compromise." "Am I, at the end of the day, happy that this project has to be built here? No. But it's a bit of compromise," she said. "This, for me, is about what community looks like. Community is not big I's and little U's. It's about everyone being at the table or being involved. Even if we can't at the end of the day reach an agreement about our needs, we can compromise. I can hear what you're saying and you hear what I'm saying. And we can find common ground where both parties are satisfied, where the outcomes can benefit both parties. I think that's success. And I think that's what we have." 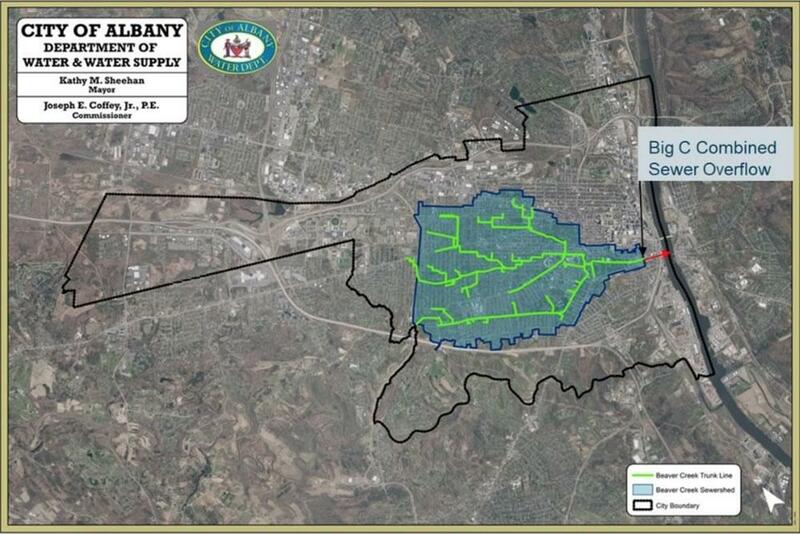 The combined sewer overflows, the flooding, and the backups associated with Albany's old sewer system are, collectively, a problem that's more than a century in the making. And it's a problem being made worse by the intense rainfalls this area seems to get more often now. The Lincoln Park facility will be a big step, but it's still just a piece of the puzzle. Toward that end, the water department has been pursuing other projects around the city aimed at reducing stormwater that runs into the system. It's built underground facilities to act as buffers. And it's working on "green" infrastructure that should soak up water and release it slowly. After Tuesday's meeting, Coffey said it's important that residents, sometimes skeptical, find a way to work with these sorts of projects and take steps themselves to help via things like rain barrels. "At some point we're all going to pay if we don't start doing smart things now," Coffey said. + There's a Lincoln Park master plan public meeting next Tuesday, December 4 at TOAST at 7 pm.